Everyone in my house that wants a cargo duffle now officially has a cargo duffle. Earlier this Fall, I made myself a Cargo Duffle (super cool pattern by Anna over at Noodlehead). The kids immediately wanted their own bag for weekend trips and sleepovers. I let them look online at fabrics and they both chose different Lizzy House designs for their focal prints. I can't blame them - her designs are the perfect mix of whimsical and modern. 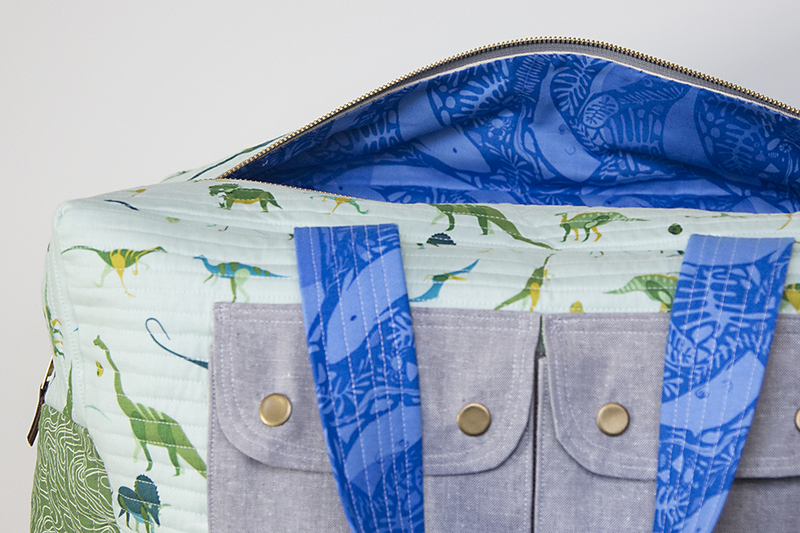 My son really wanted a dinosaur bag, featuring Dino Exhibit in Aqua from Lizzy's Natural History collection. 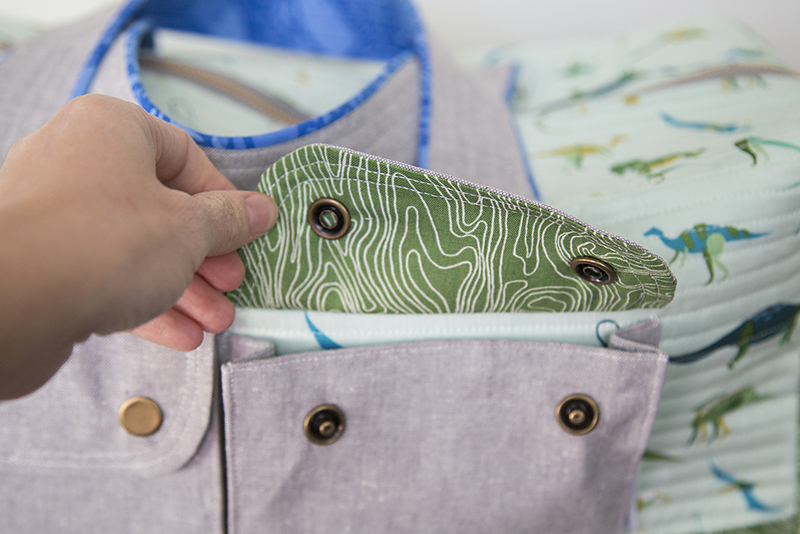 For the accent on the bottom, I sort of fell in love with the idea of using Carolyn Friedlander's topography print in the perfect green from her Architextures collection. Of course it is now no where to be found! I put out a desperate call for a trade and my friend Cristin generously offered up her half yard for swap. I'm so happy because I love how it turned out! I also used the very last of the scraps to line the pockets. 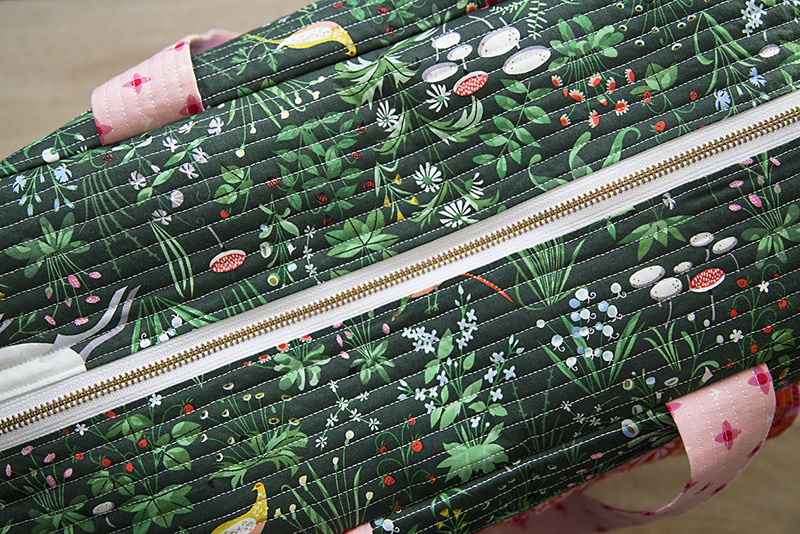 The outer pocket fabric is an Essex linen by Robert Kaufman. I'm becoming more and more addicted to working these into my projects. When I wrote about my first Cargo Duffle, I mentioned some alterations I made when assembling it (widening, adding lining). I did the same for these and my son chose another Natural History Lizzy House print for his lining ~ Giants of the Deep in Blue. I selected a gray zipper to match the pockets. The pattern requires a pretty specific zipper that I couldn't find locally, so I bought mine online from WAWAK Sewing Supplies. They ship from the US, so it didn't take long for them to arrive! I love how his turned out! My daughter really wanted a unicorn bag. We found (what we thought) was a unicorn print from The Lovely Hunt, another collection by Lizzy House. Unfortunately, when it arrived we discovered it was a very large repeat. This meant only one full unicorn was able to make it onto her bag. She was disappointed but I put it smack dab in the middle of the back so you can't miss it. 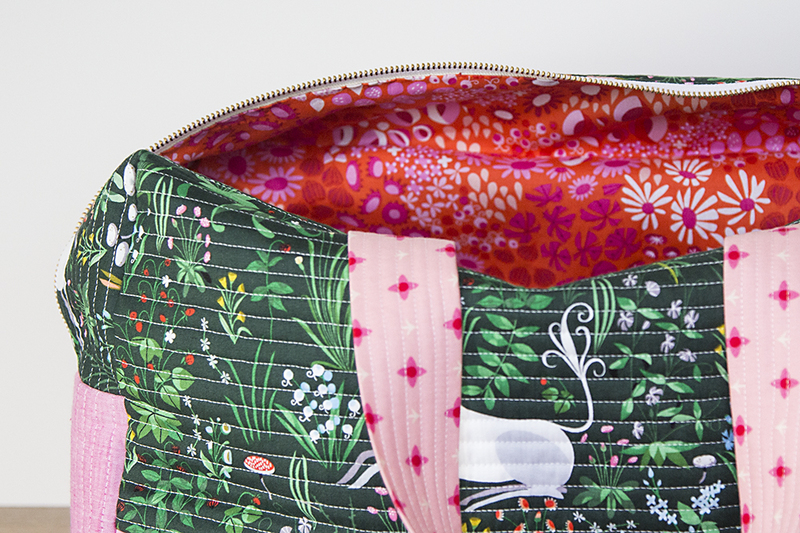 Luckily the rest of the print is just beautiful with a variety of floral designs. We combined that with Stellar Slub Chambray in Cerise by Andover for the bottom. This was much thinner fabric than I anticipated, so I used an additional layer of fusible fleece interfacing on the back of it to thicken it up. For the pockets, she chose a combination of Meadow Flower in Pink and Flower Carpet in Fuchsia, also part of The Lovely Hunt. The lining is more of the Flower Carpet in Fuchsia. And the zipper is white. The kids were both SO excited when they came home and saw their finished bags. My son immediately loaded his with stuffed animals and declared himself ready for a sleepover!